The Ken collection by Jennifer Taylor Home is the perfect addition to any living space looking to add a bit of a traditional flair. The fabric selected for the collection features Polyester blends and engineered for long life. Our wood frames are made from kiln dried birch wood which provides exceptional support and stability. This unique design is accented with hand tufts along the back and decorative cords along the edges. The Ken is an ideal choice for your living room, den, office, or any living space you prefer. This 3-seater sofa brings class and lounging comfort to any room in the home. We offer a unique versatility in design and make use of a variety of trend inspired color palettes and textures. Our products bring new life to the classic American home. The Ken sofa brings a traditional look while providing ultra comfort. Upholstered in velvet, this sofa will give you the feeling of luxury, elegance, and nobility. Hand crafted and fabric featuring polyester blends, it is built to last a lifetime. This unique design is accented with hand tufts along the back and decorative cords along the edges. It’s truly a perfect center piece that you can both show off and treasure. Comes in a variety of four colors to choose from. So beautiful. So luxurious. I was worried ordering a couch sight unseen. I was worried it would be way too firm. It's firm but it works. 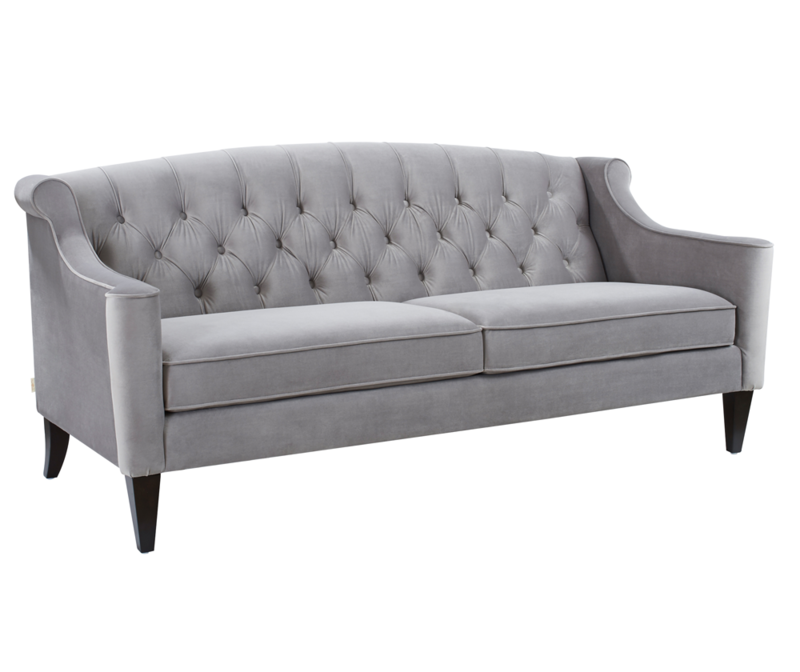 The style and structure has a more formal style than my previous sofa and the firmness seems to complement the form. The arms are lovely. The detailing in the back is great. It sits up off the floor. It's delish. I'm short and my feet don't touch the floor when I set all the way back. But that's normal. My husband is tall. (He loves the sofa more than me.) But he looks just a tiny bit too big for the sofa. Just understand that it's not a large sofa. But wonderful all the same. I adore my sofa!! It's simple but very chic, and adds a touch of glamour to my office. I love how firm it is as well. My favorite piece of furniture so far!! I ordered the opal grey and could not be happier! Couch is exactly what I wanted and fits my space perfectly! It is a great size and being 6'1, I can easily lay down on it. Assembly was easy and delivery guys were great! One word: WOW! We bought two for our living room and are beyond pleased with the quality of the finishes and comfort. 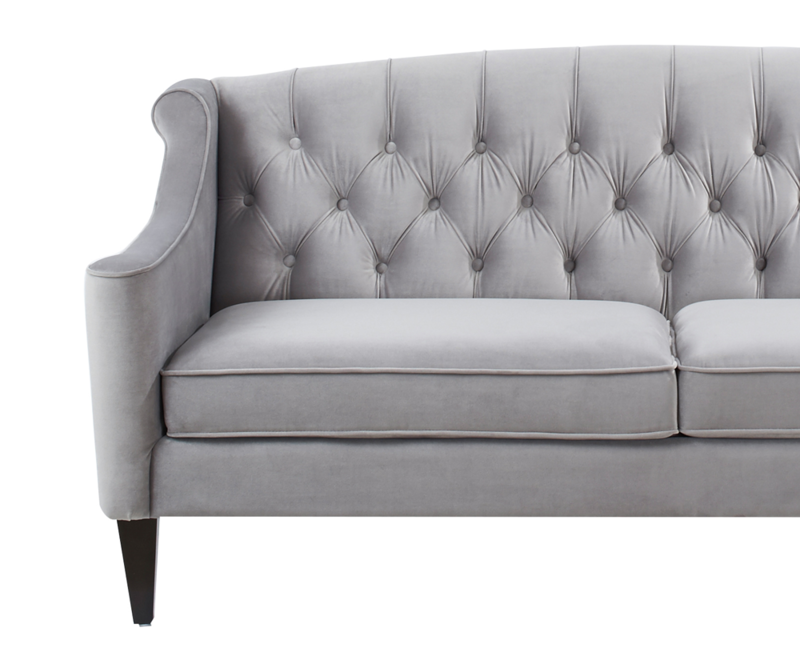 The color (gray) is exactly as pictured and we are in love with these couches! These marry well with our glam inspired room! This was essentially a first purchase for me from your site and I have to say it was nothing but great! Seemingly good quality so far. The sofa was easy to assemble. It looks every bit like the posted photo and, as far as I can tell, doesn't differ in any way. Very pleased with the entire purchase so far and rating the sofa a full five out of five! Love my 3 seater Grey Velvet Sofa. It completes my living room....the quality of the the sofa is amazing...and it looks so elegant and rich. Gorgeous, comfortable and solid as a rock. So happy with this sofa. The gray seems a little darker, like a light, warm and soft dove which I love. Perfect size and design for a glamorous Master Bedroom. So glad I decided to go with a sofa instead of a Chaise. This sofa is super comfortable to sit on or lay down and seats my husband and I with room to spare. Just so happy with the quality and beauty of it! I LOVE this sofa! Perfect size for my NYC apt without being too small. Burgundy color is gorgeous and it’s comfortable! !